A portable, handheld pie filled with pumpkin, cinnamon, nutmeg, clove, all spice, and ginger in a flaky all butter crust. I was inspired to make these handheld pies from a local company, Hubig's Pies, that have been around since 1922 and are filled with fruit. You can get them all over the place where I live. Thanksgiving or Harvest Feast is only few weeks away and one of the dessert stables for those carb loaded feasts in pumpkin pie. It happens to one of my favorite pies to eat. You get the buttery crust and the yummy pumpkin filling. Plus you get a serving a fruit. Pumpkin Spice season is slowly winding down and I've made a lot of recipes this season. Here are the links to my other recipes. Pumpkin Spice Cookie Cake, Pumpkin Spice Cheesecake Pop Tarts, Pumpkin Spice Sugar Cookies, Pumpkin Spice Pound Cake, Slow Cooker Pumpkin Butter, Pumpkin Spice Syrup and Pumpkin Spice Extract. 1. Place butter into freezer for 2 to 3 hours. You want the butter to be really cold and frozen solid. 2. Combine flour, sugar and salt. With a cheese grater, shred butter on the larger side. This will only work if they butter is frozen solid. 3. Carefully incorporate the flour and butter then at one tablespoon at a time at the cold water. Once the dough can hold together gently kneed together. 4. Cover and place in refrigerator for at least 2 hours or overnight. If you do leave it overnight just take the crust out to bring to room temperature. 5. Whisk together pumpkin puree, egg, brown sugar and spices. If you are using pumpkin butter just whisk together with egg and milk. 6. Roll pie crust out on a well floured surface to a 1/4 inch thick. Press pumpkin shape cookie cutter then place onto a parchment paper cover cookie sheet. 7. Dollop a tablespoon of pumpkin mixture onto one of the crust. Gently press sides of the crust with your fingers then press a fork along the edges of the pumpkin. Place back in the refrigerator for 15 to 20 minutes. 8. Preheat oven to 350 degrees. Brush pies with egg white and sprinkle the tops with turbinado sugar. Bake for 17 to 20 minutes or until lightly golden brown. Rotate halfway through. 9. Cool pies on pan for 5 minutes then remove from pan onto a wired rack to cool completely. Enjoy! Tip: Make sure the butter is rock solid before grating or it will be a mess. Grating the butter will give you a flaky crust. 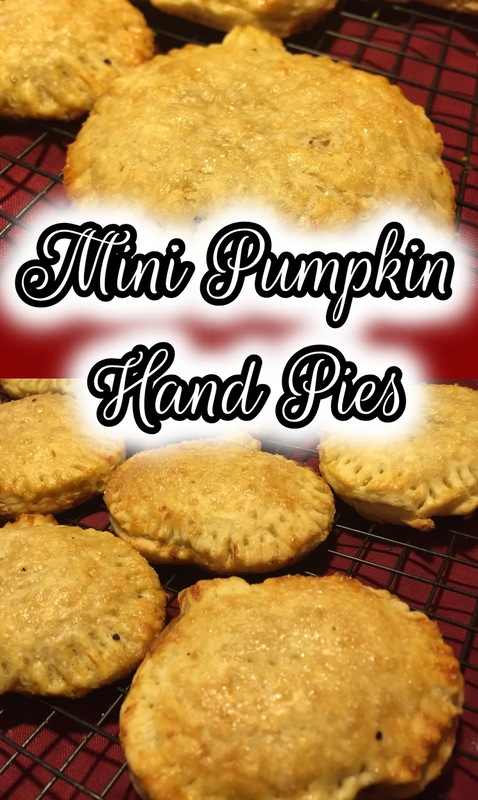 My aunt makes a version of these with sweet potato filling. Although hers aren't pumpkin shaped, this is nostalgic for me. These look amazing! I bet they could easily be refashioned into a lower carb option by using coconut or almond flour. You've inspired me to try! I'm loving all the pumpkin flavors right now and these look delicious! Your crust sounds interesting. I have never frozen butter before to do that. I'm going to have to try this! ooooh, and they're even pumpkin-shaped! So cute. These look like a fab way to use up the pumpkins this fall! Love the shape! These pies look beautiful! Great idea! Those are so perfectly adorable! I love the pumpkin shape! All fall long, I want to gobble up pumpkin flavored treats. These look sooo good, I just pinned it so my daughter and I can make them this weekend! These look adorable - would be easy to veganize - and they look pretty simple to make! What fun for the holidays! These look delicious and mouth watering too! I noticed you got the pumpkin filling at Walmart. ;) Good deal! This look so delicious. I will try to make it. I live in a tropical country, we have pumpkin all the year. It look delicious!! I love everything pumpkin flavor. I really like the idea of making the shells look like pumpkins. We have an abundance of fresh pumpkins here, still, and I will try these next weekend. Wow wow they look so awesome and very yummy.It's been long since i ate anything with pumpkins but this looks so tempting,something i could try. Am I the only one that thinks that smaller food always tastes better? These are cute, I'm gathering ideas to do some baking with kids during their break. And this looks like a great option. Thanks for sharing!